Please I want to know how to register my recycle theme I bought from Envato. I already have my purchase code but don't know what to do with it. 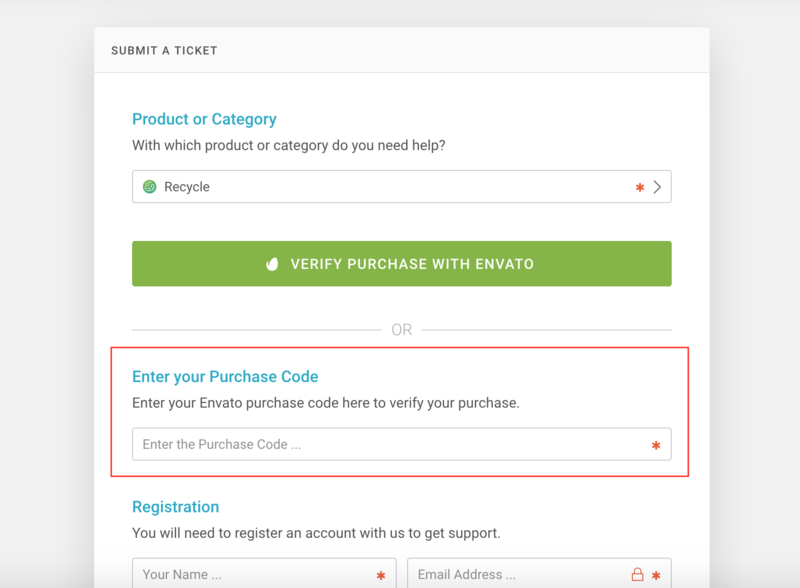 You do not need to enter the purchase code anywhere inside the theme for the theme to work. You just install the theme, install the plugins and import the demo in Theme Options -> Demo import and you can start customising it. I have been getting my site hacked recently so I thought, maybe it's because I haven't registered the theme. So how do I stop the theme attacks. The theme usually is not the reason behind a WordPress attacks - unless downloaded from a shady source. Majority of the hacked sites are the result of hacker acquiring either FTP or Wordpress admin passwords. This is something which can be avoided. 1. Never download Plugins or Themes from untrusted resources - This helps to prevent any malicious code running on your WordPress. 2. If you have multiple websites, keep all websites on separate hosting accounts, with different FTP passwords. If one site gets hacked, this will prevent spreading it to other sites you own. 3. Use unique passwords for each of your websites. Never use same passwords as you use anywhere else. Use password manager software like KeePass or LastPass or similar to keep track of them. 4. Do not use "admin" as username in WordPress. Change it to something else. Hackers use scripts to automatically test random passwords for the "admin" user. 5. Keep your WordPress, theme and plugins updated. Cleaning up an infected site does require some technical knowledge and should be done by a professional. Before doing anything, a full backup is recommended, just in case. - Replace all Plugin files with latest version of each plugin from official source. - Replace all Theme Files with the latest version of the theme. 2. Change admin, FTP and hosting account passwords. 3. Manually check .httaccess and wp-config.php for any potential malicious code.